Recently a fellow on twitter known as Dodekatheoi (we’re following each other) requested a pixel-art icon from me for his various social media and gaming accounts. In particular he wanted those icons to represent the infamous antagonist of the Matrix trilogy – Agent Smith. He also required that these icons be at screen dimensions of 100 x 100 and later on at 400 x 400. An intriguing prospect to say the least, which I was happy to dive into. The Matrix movies are fairly stark visually, this works particulalry well in context. Everyone should have an idea of what these movies are about with their rather pessimistic, cyberpunk flavour. Mostly monotone colour hues are used throughout the trilogy, painting a grim alternate reality. Fortunately, pixel-art with it’s reliance on limited colour palettes is a perfect fit for such renditions in low-rez. Capturing the very essence of what Agent Smith is about would be a key goal. I, therefore opted to work directly from a still image from the movie which perfectly depicted this. At first glance, it would seem that by merely dithering the image the desired result would be produced. However, this is not the case as dithering such a low-quality image only produces a terrible, uneven pixel texture. Images like these, typically found with a google search and of standard definition video quality are overwrought with screen artifacts. At best, this image would only result in a cheap, dirty digitized look and not that of carefully crafted pixel art. 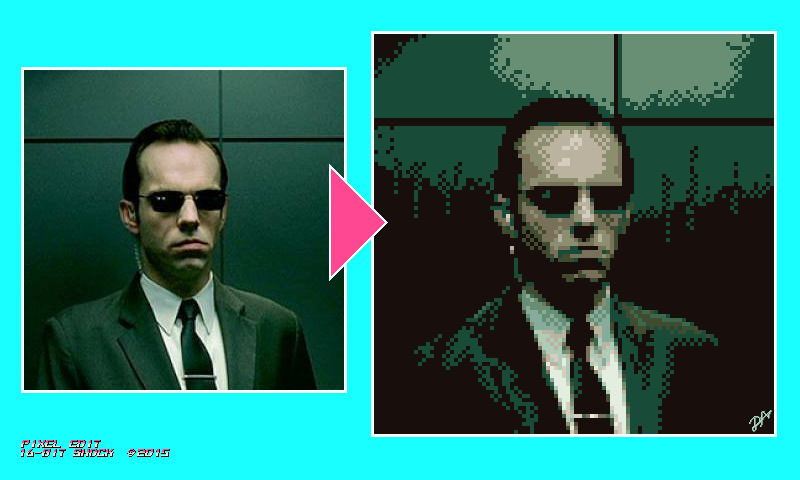 Nevertheless, the image was not completely useless – after all the depiction of Agent Smith was ideal. I decided to apply a hard contrast and then mask the image, giving me a good trace of the character. The mask was then layered in a new image to work on at a screen resolution of 100 x 100 pixels. After this I proceeded to clean up the image, getting rid of some nasty, rough edges and those odd pixels that were just at the wrong place. Next came one of the most important steps in putting together a colour palette that would do the image justice. I decided to work in 8-bits per pixel from the get-go and narrowed the palette down to 12 colours. Initially when I started allocating colours and testing them out, I was already up to 20 colours but quickly ascertained that that’s too much. I gradually got rid of the unneccessary colours, keeping only those that worked best with the others within the palette. I always keep a Wacom Intuos tablet handy for drawing purposes even though I’m proficient with a mouse. For pixel-art I feel the mouse is often the better choice but there are certain aspects that a pen and tablet handle better. In respect, to drawing organic imagery a pen and tablet beats out the mouse more often than not. Ditto for shading purposes, I’ve found there is a greater speed advantage with the Intuos. And in the case of the Agent Smith icon, the tablet came in as an indispensible tool. The process from here on was a matter of working on those dots diligently, for a small image size such as this I seldom use more than 3 layers. Once the image looks satisfactory, it’s time for some minor colour balancing. 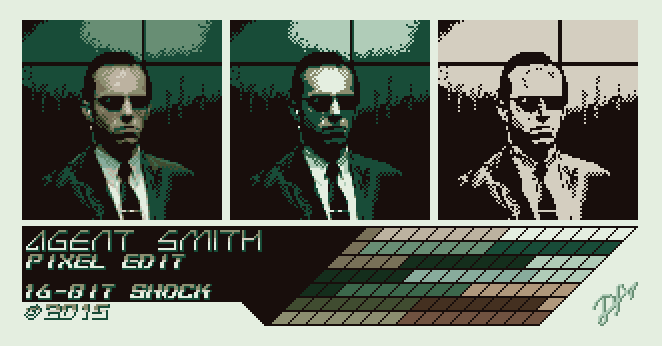 Finally the image is complete and we have ourselves a nice rendition of Agent Smith with only 12 colours. I decided to further reduce the colour down to 8 colours on a secondary image and then down to 1-bit colour depth which comprises of only 2 colours. Generally the process as a whole is not terribly complex, nor is it the only way to go about doing this. But I believe this one of the more efficient methods for pixel pushers. In my next pixel art article I will reveal some similar work I’ve done on Raiden, the main protagonist from Metal Gear Rising: Revengeance.